Kivikko is a new line of seating furniture for public areas aimed at creating informal groups of seats for people of all ages. The Kivikko pieces of different shapes and sizes can be used alone or in larger combinations, which creates a scenic arrangement of seating furniture in the room according to need. Kivikko is an ecological choice, as the seats are manufactured from the surplus material generated by waste and cut-off pieces of foam and plastic products. The waste generated in the manufacture of Kivikko is also returned back to the manufacturing process as raw material. 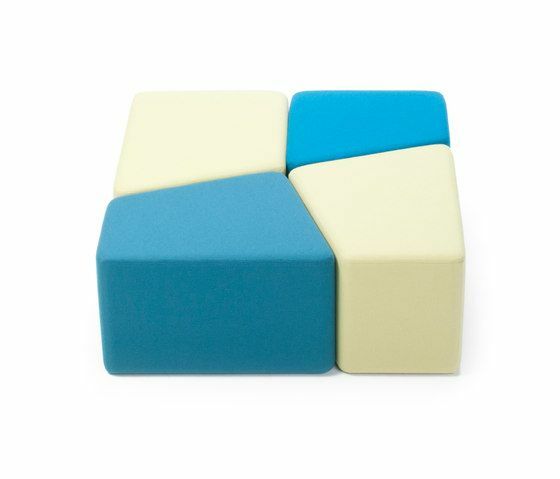 The Kivikko seats come in three different heights: high (54 cm), medium (40 cm) and low (26 cm) seat. Kivikko is available in six sets with different sizes and contents, based on using the material as efficiently as possible. Each set includes pieces of four different shapes, and if desired, each shape can be upholstered with a different colour. The upholstery material is fabric or leather.